Chicago is in a hot, humid sunny zone while severe weather has developed to the north and to the south. The storms that are likely to hit Chicagoland are just passing Peoria in western Illinois about 5:00 p.m. Currently wind and weather conditions are not expected to develop rotating supercells that can produce tornadoes, but severe straight line winds are possible. The sunlit heat and humidity could provide energy to storms that will reach Chicagoland at a time just about sunset, when cooling and instability is enhanced. Tornado watches existed Tuesday afternoon in southern Illinois, and severe thunderstorms downed 12-inch trees and utility poles in Waukesha County in Wisconsin to the north of Chicagoland. 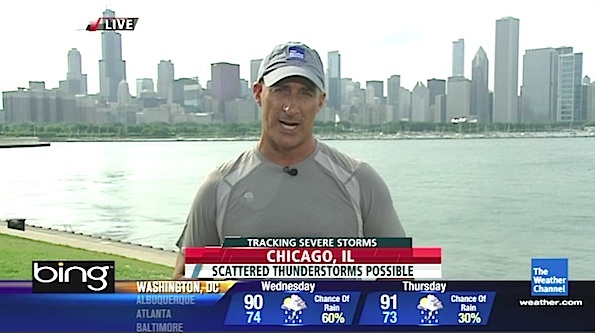 Jim Cantore forecasting Earth, Wind & Fire … and lightning and thunder at the Charter One Pavilion- Northerly Island, where he could hear the sound check for Earth, Wind & Fire.